Happy Monday! I'm back from a girls weekend with my sisters and my mom. We had an amazing time shopping, eating, and getting lots of laughs! One of my favorite parts of our trip was a visit to the American Crafts offices/warehouse. It was amazing to see how things work behind the scenes. There warehouse is huge! I got to meet so many amazing people and even peeked in on a meeting about upcoming collections. The whole building was filled with inspiration. I left there so inspired and exited about what I learned! I think learning about what goes on behind the scenes will help me to do a better job! My sister-in-law snapped this photo just as we were leaving. 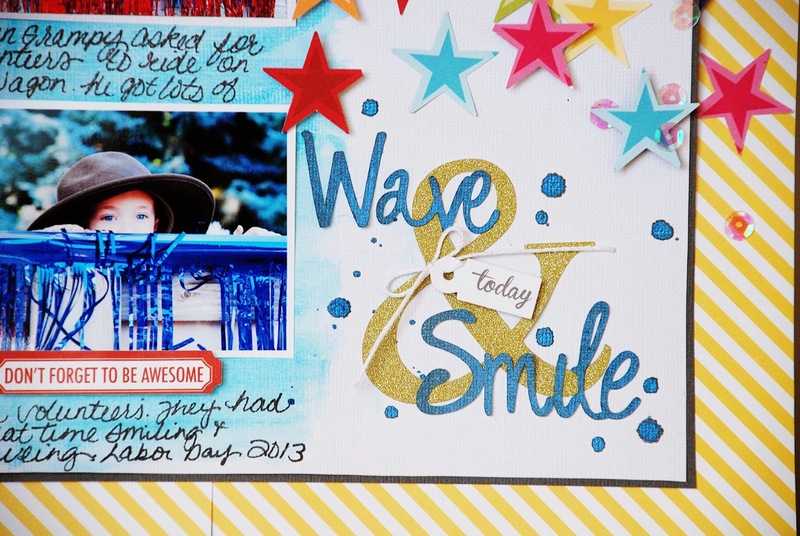 Before I left I created a fun project for the latest issue at Paper Issues. There's a new issue starting today! It's all about Counting your Lucky Stars. 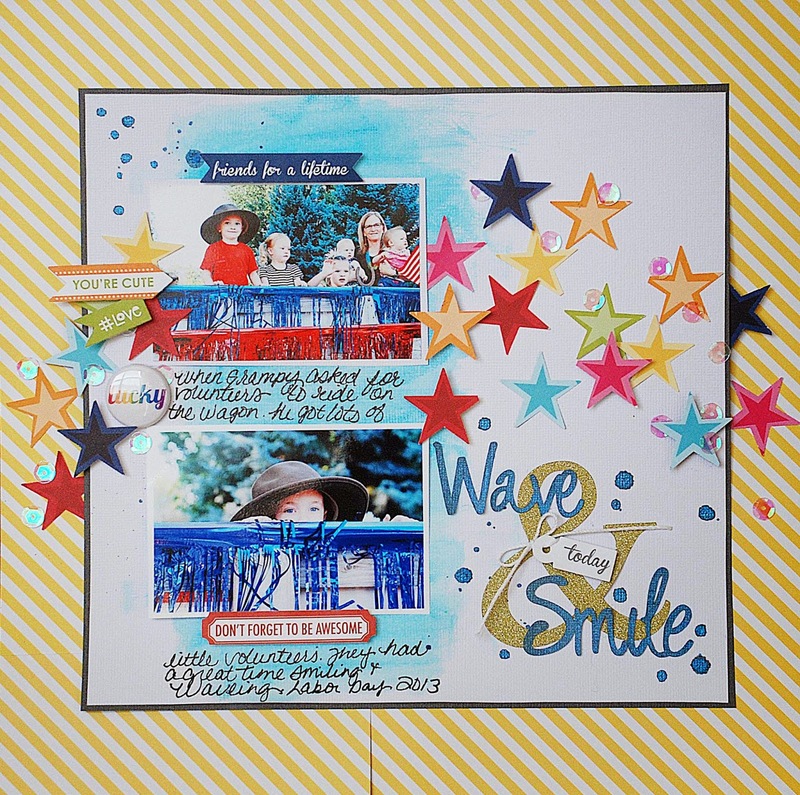 I used tons of stars on this project from Bella's Lucky Stars Collection, the March Swag bag from Paper Issues, my Silhouette, and THIS font from Lori Whitlock. Lori is sponsoring this issue so if you link your project HERE you'll be entered for your chance to win a $25 gift certificate to Lori's store. When I sketched this page out I didn't intend to have anything behind the photos. When I got the photos and stars on the background The photos seemed to get lost in the business of the stars and strips. I added a strip of patterned paper behind the photos but I didn't like the look of that either so I decided to do a water color wash with gelatos. I love how it made my photos stand out but it's not overwhelming either. Thanks for stopping by, I so appreciate it! If you have any questions please let me know! I love hearing from my readers! Have a great Monday! This is just adorable Becki! 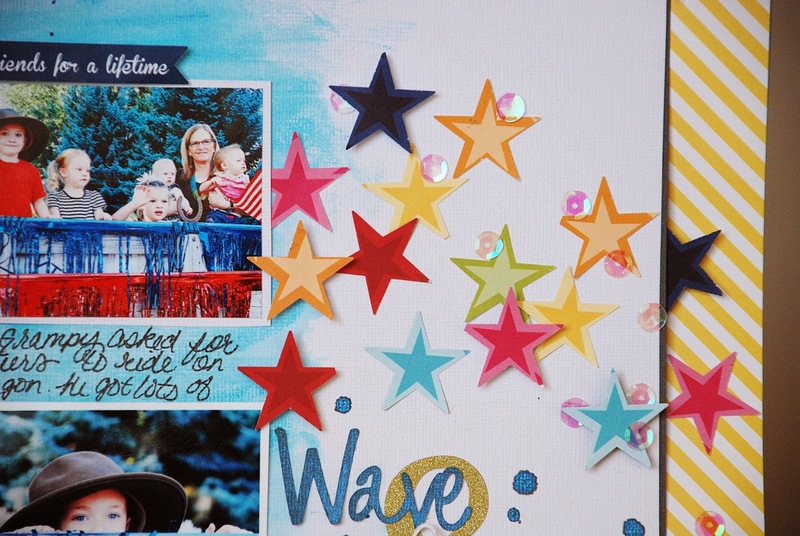 Loving all of the stars, Becki! Fabulous page! love this page Becki! I just picked up some gelatos and need to try them out! This is so fun, Becki! Absolutely love this!